Specialist qualification in handicrafts 2014. Designer-artisan 1994. Precision mechanic 1987. 3D lab designer, Nokia Design 2000-2009. Design modeler, Nokia Displays 1995-2000. 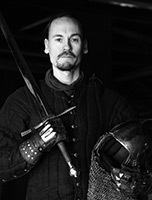 Founding member of Armorers guild of Turku, 1997, active chairman and instructor. Founding member of Turku Aikikai, member of the board 1991-1994. My goal is to reproduce arms and armour as close to original medieval and reneissance pieces as possible. Although I can obtain handmade bog-iron, etc., its cost and processing time is over thirty times that of modern steel, thus its use is only reserved for very special pieces. Otherwise tools and fabrication of arms and armour follows those used by our ancestors. It's also possible to have armour repaired and modified, including those made by other smiths. How to order Please note that the prices quoted on the gallery pages are given as examples only and may vary greatly even with similar looking pieces. Prices will depend on the materials used, as well as the level of detail in both construction and finishing. Please contact me first so we can discuss the details to get an price estimate. Half of the fee is to be paid in advance and the rest paid upon delivery. Bank transfer, Western union or PayPal accepted (+3.4% to cover fees).